Every month on the first Friday, the Federal government issues a report known as the Non-Farm Payrolls report. This is a very important economic indicator for many sectors including real estate. The report is developed by the Bureau of Labor Statistics, and it shows how cost and employment are affecting the economy. Everyone on Wall Street pays close attention to the Non-Farm Payroll report. It influences the stock market, and gives a healthy indication on the health of the sales market and public ability to spend money. The report also has a strong influence on lender’s interest rates for mortgages. One reason for this is that lenders can see how likely people will be able to afford new mortgages. It also gives an overview of how the stimulus program from the Federal Reserve relieves pressure on the economy and current mortgage rates. October’s report is ready to be released on Friday. If the results shown on the report are better than expected interest rates go up and APRs show an upward swing. If the results are worse than economists expect, rates and APRs drop. The Federal Non-Farms Payroll report gives a very broad overview of the labor market in America. It breaks down the figures by industry, and shows where the economy is improving and what areas are in decline. The report also shows the unemployment rate throughout the nation. It is put out monthly and Wall Street finance markets pay close attention to its results. Increases in jobs mean strong economic increases and provides incentive for investments. In the last decade, the job report has an even greater influence. The Federal Reserve stimulus program has spurred the economy with the intention to continue as long as required to strengthen the economic atmosphere of the country. With interest rates on mortgages falling due to economic pressures presented in the Non-Farm Payrolls report, refinances and new mortgages have gone up as well. The low rates have given people added income by lowering monthly payments on their homes, so savings are going up and consumer spending is higher than it would be without the stimulus. Because of the influence of the stimulus, Freddie Mac reports 3.98% interest rates on conventional home loans across the nation. VA and FHA mortgages are even lower. Rates of federally backed loans from the VA and FHA are 0.25 to 0.375 percentage points lower than conventional loans from lenders. Lenders are starting to catch up, and many are offering home loans in the 3s and low APR. These changes are allowing home owners to refinance and new home buyers to get cheaper monthly payments and save hundreds of dollars on payments every month. Figures show that the average home owner using the HARP program when they renegotiate their home loan can save 31% or more on their monthly payments. The labor market in America is strongly related to the housing market. Jobs make it possible for people to make mortgage payments and own their own homes. Jobs give consumers confidence to go out and seek the life they desire, buy a home or refinance. At the same time, the supply and demand in the market is influenced by an influx of consumers newly able to seek home mortgages. When many new buyers enter the market thanks to an increase in ability to purchase a home, sellers gain more leverage to get higher prices which creates wealth. This is another way that jobs increase confidence through providing financial stability. The jobs market also influences the mortgage industry, because people who have a job are more likely to be approved for a home loan. There is even a loan that allows people to obtain a mortgage even before starting a new job. This is known as an offer letter mortgage. The increase in economic strength powering the rise in U.S. home values is no surprise to economists. With the current job market increases, sales prices have increased as much as 20 percent compared to a decade ago, and some markets even double that in areas such as Los Angeles, San Francisco and Phoenix. The idea of higher home values may not seem like a great thing for a buyer, but with lower interest rates making the same value homes more affordable than they have been in years, both sides of the transaction, buyer and seller, can have very happy results. 30-year home loan costs are lower than they have been since mid-2013, and mortgage affordability is at its highest in history. That combination has created a market where homes are selling quickly. In just the last month 40% of available homes sold in less than 30 days. Friday’s Non-Farm Payrolls report may have a big impact on the current mortgage availability. If the report is strong, interest rates will go up and buyers will get less house for their money. If you are considering buying a home, now is the time to lock in a mortgage rate. When the recession hit the U.S. between 2008 and 2009, the mortgage industry fell apart. The collapse of the housing market prompted the Federal Home Finance Agency, FHFA, took Fannie Mae and Freddie Mac under government control. This resulted in a catastrophic 7.4 million jobs being eliminated. Since that time, hiring has resumed and 9.2 million jobs have opened up. While some of those jobs are not equal to former employment situations in terms of pay or status, they still have given the public the needed value and confidence to provide for themselves and their families. Combined with the drop in unemployment a strong jobs report will compel the Federal government to raise the Fed Funds Rate. This is an indicator of a strong economy and inflationary pressure. This increase will lead to mortgage rates and falling home sales. Economic forecasts predict as many as 240,000 new jobs for October, and some estimates are higher. 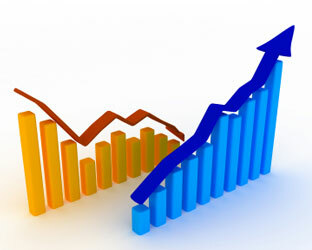 This means interest rates are likely to increase immediately following the report. Now is the time to get a mortgage rate locked in. On Friday, if the report is higher than what the economists predict, or at the top of the current estimates, interest rates will go up.